(L-R) Wounded Warrior Project’s Michael Richardson and Alonzo Smith presented a $29.2 million check to Emory Healthcare Veterans Program representatives, Lieutenant General (ret.) 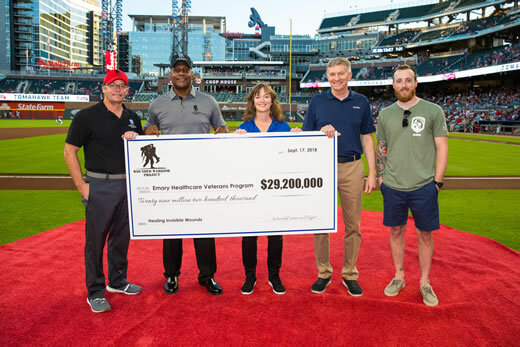 William “Burke” Garrett and Sheila Rauch, PhD, along with Marine Veteran Timothy Banik, during a Sept. 17 pregame presentation at the Atlanta Braves’ SunTrust Park. For more information on the Emory Healthcare Veterans program, please visit emoryhealthcare.org/veterans or call 1-888-514-5345. The Emory Healthcare Veterans Program has received a five-year, $29.2 million-dollar grant from Wounded Warrior Project to further its work providing transformative care for Veterans suffering from post-traumatic stress disorder (PTSD), traumatic brain injury (TBI),dd depression and anxiety. The Emory Healthcare Veterans Program is one of four U.S. programs that are part of Wounded Warrior Project’s Warrior Care Network, a first-of-its-kind treatment partnership that provides world class mental health care to Veterans or servicemembers who served/deployed after 9/11. The Emory Healthcare Veterans Program operates an intensive two-week outpatient treatment program. The program is a comprehensive regimen helping Veterans re-engage in daily life, while promoting physical and mental health and wellness. Veterans and servicemembers from across the country who qualify for the program are treated at no cost, giving them access to a wide range of services including daily individual therapy, group therapy, family therapy, wellness services, finance and career classes, and various recreational activities. “We are honored to receive this critical funding to help us continue our innovative Veteran health care efforts as we reach a generation of warriors, ultimately providing treatment and care that help to ensure they are the most successful and well-adjusted in our nation’s history,” says Emory Healthcare Veterans Program director Barbara O. Rothbaum, PhD, professor of psychiatry and behavioral sciences at Emory University School of Medicine. The $29.2 million grant includes funding to continue treatment for warriors and a capital grant to expand the Emory Healthcare Veterans Program’s physical space and increase treatment capacity. It follows a 2015 grant from Wounded Warrior Project for $15 million to help establish the current program.